A Digby fishing boat at low tide. Scallops are Digby’s claim to fame. 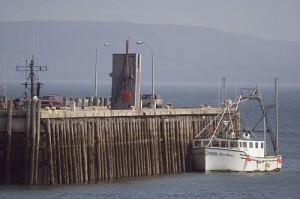 The town is also a first port of call for visitors arriving from New Brunswick on the Saint John to Digby ferry. Lunch in Digby is a great idea. The Royal Fundy Fish Market, on Fisherman’s Wharf does take-away lunches. Walk along the waterfront afterwards to see the scallop fleet and visit the tourist information office. History buffs might also visit the Admiral Museum, set in a Georgian-style home from the 1800s. The town has a reasonable selection of accommodation, including the luxurious Digby Pines resort, but many visitors will prefer to push on to more scenic vistas in nearby Digby Neck and Brier Island. The only time crowds really descend on Digby is during the Scallop Days festival, held during the first week of August. There’s a parade, markets and a scallop shucking contest. The festival website has more information.